Israeli Prime Minister Benjamin Netanyahu walks with House Speaker John Boehner of Ohio to make a statement on Capitol Hill in Washington. Defying President Barack Obama, House Speaker John Boehner announced on Wednesday that he’s invited Israel’s prime minister to stand before Congress and push for new sanctions against its archenemy Iran. Boehner’s decision to bring Benjamin Netanyahu before a joint meeting of Congress on Feb. 11 seemed to catch the White House by surprise. And it added fuel to a drive by lawmakers from both parties to pass legislation calling for fresh penalties if there is no deal soon to prevent a nuclear-armed Iran. Barely sworn in, the new Republican-controlled Congress is already on a collision course with Obama over a major foreign policy issue. Obama has threatened to veto any new sanctions legislation, saying it could scuttle ongoing nuclear talks with Iran and heighten the risk of a military showdown. But Boehner is not backing down. He told a private meeting of GOP lawmakers that Congress would proceed on further penalties against Iran despite Obama’s warning. The White House said Boehner’s invitation also was a breach of diplomatic protocol. Traditionally, no administration would learn about a foreign leader’s plan to visit the United States from the speaker of the House, said State Department spokeswoman Jen Psaki. The invitation was a coordinated effort involving Boehner and Senate Majority Leader Mitch McConnell with staff discussions beginning last year, according to a senior Republican aide, who spoke only on condition of anonymity because he wasn’t authorized to publicly discuss the private talks. 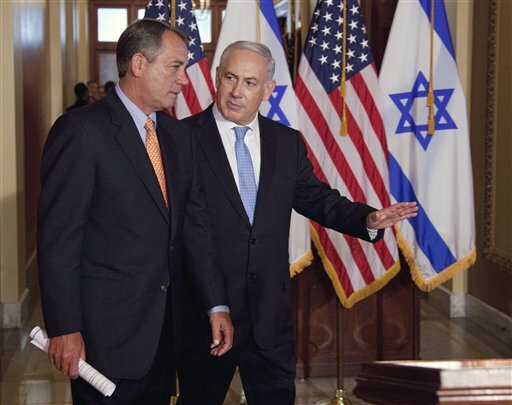 Boehner contacted the Israeli ambassador on Jan. 8 to assess Netanyahu’s interest and received a positive response. The image of Netanyahu addressing Congress — an infrequent honor for a world leader — could undercut his opposition’s message. At the same time, he risks aggravating the tense relationship he currently has with the Obama administration. Time could be running out to reach a deal with Iran, which says its nuclear program is peaceful and exists only to produce energy for civilian use. Talks have been extended until July, with the goal of reaching a framework for a deal by the end of March. Just after Boehner announced that Netanyahu had been invited, the Senate Foreign Relations Committee held a three-hour hearing on the Iranian nuclear talks and the role of Congress. Republicans and some Democrats on the committee argued that Iran is playing for time and that the U.S. and its international partners are inching closer to Iran’s negotiating position. But other lawmakers agreed with the administration that it’s best to let the negotiations play out. Committee chairman Sen. Bob Corker, R-Tenn., is pressing for legislation that would allow Congress to vote on any deal the U.S. and its international partners might reach with Tehran. “I want these negotiations to be successful … but just stiff-arming (Congress) . and saying, ‘No, we really don’t want you to play a role, we want you to just trust us,’ is totally unacceptable from my standpoint,” Corker said. Sen. Bob Menendez of New Jersey, the ranking Democrat on the committee, and Sen. Mark Kirk, R-Ill., are pushing legislation that would impose heavier sanctions that would take effect if there’s no deal. That bill would not impose any new sanctions during the remaining timeline for negotiations. But if there’s no deal, the sanctions that have been eased during the talks would be reinstated and Iran would face new punitive measures. “Iran is clearly taking steps that can only be interpreted as provocative, yet the administration appears willing to excuse away any connection between these developments and signs of Iran’s bad faith in negotiations,” Menendez said. He argued that the talks have halted Iran’s rush toward larger stockpiles of enriched uranium and have led to more intrusive and frequent inspections. Blinken said the existing sanctions are stifling Iran’s economy. “Iran is well aware that an even sharper sword of Damocles hangs over its head. It needs no further motivation,” he said. Associated Press writers Andrew Taylor, Donna Cassata, Nedra Pickler and Matthew Lee in Washington, and Dan Perry in Jerusalem contributed to this report. Can there be any doubt about who our foreign policy serves if we let a foreign head of state make a war speech before our congress? The USA deserves an independent foreign policy not dictated by Tel Aviv. US sovereignty is under attack by these AIPAC turncoats with their dual citizenship who spend 3.5 Billion a year in your tax dollars to fund a theocratic apartheid state in the middle east.